For sensitive environments. Less of an impression left behind is better when using a crawler type machine. The nylon grousersare able to achieve this because it is made from polyurethane and is able to bend to provide optimum weight distribution. Nylon Grousers are available in popular sizes such as D4, D5, D6 and up to 1900 mm wide for low ground pressure. 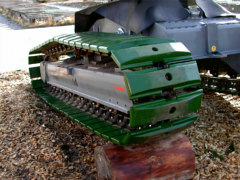 The pads can be used on machines with weights up to 20 tons. Nylon Grousers offer the highest level of protection for ground surfaces. This is becoming a greater concern for contractors and clients. The use of the flexible pads has made possible, sensitive land reclamation projects and the harvesting of previously unreachable timber. 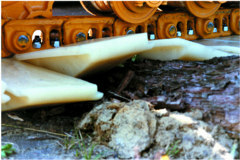 Rugged bolt-on polyurethane pads to fit most crawler machines. Pads can be installed or removed in approximately 1 hour. Allows for quick entry over a sensitive area. long service life due to high wear and tear resistance. reduction or prevention of ground damage. Less shock and wear on links and sprockets. high degree of flexibility and displacement of the base plates. operational range from -35C to +100C under dynamic loading. weight reduction of up to 60% in comparison with steel caterpillar running gear.